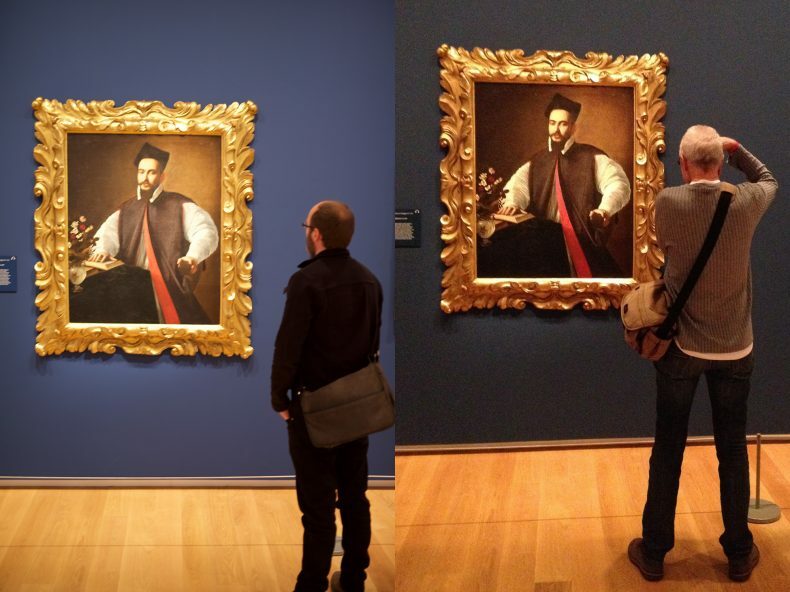 Te Papa framers James Kirk and Matthew O’Reilly recently visited The Corsini Collection exhibition at Auckland Art Gallery Toi o Tāmaki to study fine examples from the Florentine framing tradition. If we thought about it, many of us would have a fair idea of the skill-set of a picture framer, built around the experience of getting our things framed at a frame shop. In museums the picture is more complicated, as it were, and as a result the work of a framer is also more complicated. Frames are ancillary artefacts of design: most often not what our eyes are looking for, yet when appropriate they properly belong to the artworks that are acquired. They may usefully represent the now absent interior spaces and aesthetic dispositions of original owners. The fact of their ancillary nature need not be construed as a lack of value in the visual field – quite the opposite would be true if they serve their constituent functions properly. It is incumbent on museums not to neglect the frames of paintings in their collections. It is incumbent on them also to recognise the signs of original framings and the social and aesthetic evidence they represent before, as frequently played out globally in Modernism’s heyday, they are discarded and lost for good. The Modernist period of art may be over but its after-effects certainly are not. Now, after a few more than 30 years as framer of paintings at Te Papa my job increasingly involves the passing of my knowledge of the art of picture framing to my successor, James. As all framers who treat their work seriously know, as we two certainly must, the acquisition of mechanical cut-and-join skills is by far the least of what is required to make a frame that performs its functions well, especially in historical terms. There is a small number of fine European frames from which to learn directly in New Zealand . 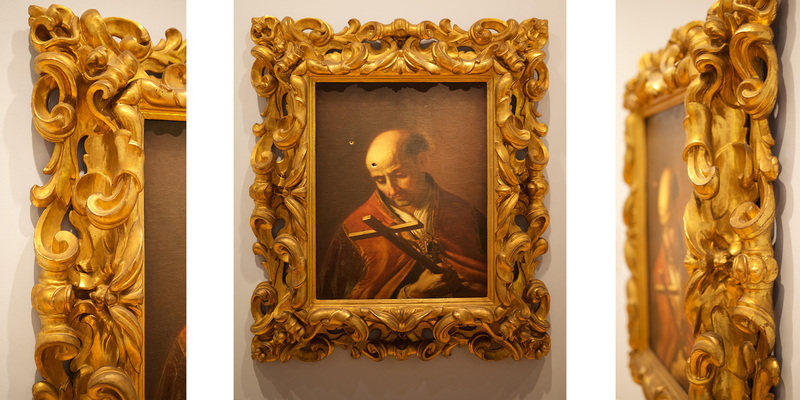 The occurrence of The Corsini Collection in Auckland presented an opportunity to show James actual examples of frames from Florence, the prime site in the evolution of modern paintings and their frames. Famous for its design and artisanal skills, enough to match its entrepreneurial wealth, what happened in Florence before, during, and for long after the Renaissance influenced the activity of framing that remains relevant to us, here, despite distance and Modernism, and that is practised here among the collections of our museums. A number of outcomes were sought from our visit which could not be found from looking in books or at screens. Such outcomes required the spatial experience of movement through the exhibition spaces, and slowingly past individual works, the better to understand the impact that historic frame designs, formal qualities, and their material realities have upon the viewer of paintings. Because frames embody and express relations, the outcomes we sought were also intended to clarify the fundamental relationship―at the level of singular examples―between design and function as expressed in a place and in periods other than our own; to see from the evidence of this remarkable tradition, in three dimensions, just how such frames go about ordering relations between us, the viewers and the artworks we seek. Frames’ designs can act to affect the rate of our movement, hopefully to still our movement and with it our minds, and thus affect the perception of the object that is privileged―enough to form a relationship with it―to reveal its subject, and to see it as worthy of active experience and meditation, by whose material means it differs from reproduced images . In our own day and age, we have little consciousness that frames―since the interventions of Modernism―actually can and do possess this very influential function. Because, in this show, we are seeing shapes and forms largely unfamiliar to us, from another era and culture and so far away, it takes some time to come to terms with them. In Aotearoa we may never be completely at ease in the company of such hard power, until we think of the analogous power of much Māori art; and formal similarities, come to think of it. The impact can be quiet and subtle or a tour de force: frame design has encompassed and expressed a wide gamut of intentions from its instigators―artists, dealers, collectors, architects, designers, and craftspeople―usually channelled through the styles of their day. The majority of players have been moved by a love for form or materials, and the intimacy with them to express the purpose of frames in ways that were and remain apposite with respect to the time and place in which they lived. To walk past ensembles of framed paintings, witnessing the frames’ Renaissance, Mannerist, or Baroque strategies in the oblique view, as well as the direct frontal aspect of the ideal vantage point in the theatre of perspectival art, is to take in the pivotal role frames play in relating the viewer to the task of really seeing in an intended manner the privileged subjects they contain and the art of the painter, the period and place of the conception, the reconciliation of two dimensions to the third. That is, frames relate in ways that maybe a movie can simulate and still photos not, those perceptions that are the result of human contact with the painting and its visual context, of sharing the same space: seeing the thing itself is the gift of museums. The professional (but passionately felt) obligation of the good museum framer speaks to and is a sign for the relationship of the lover of art to the art that is loved; of the interest or the obsession of the collector with the object of care and fascination. Just as there is a greater relevance and benefit to our society to be exposed to art in all its variety, places, and moments of origin so are there too the frames, whose history is just as ancient and intimately connected to art, its production and display. Frames are the primary, the only, visual marker of that personal relationship. 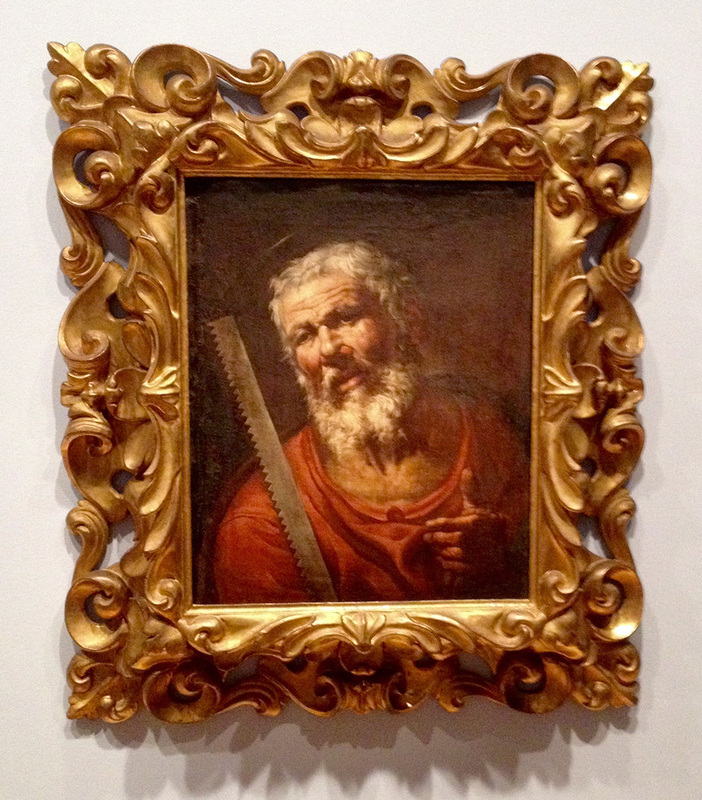 Original frames are particularly important in this respect for they present evidence of a specific aesthetic relationship most often of the person giving the work value through their investment in it, to which museums ought to pay attention. The representation of historical time is an important task and through the visual context of their frames artworks can help the viewer apprehend and keep the purpose of that knowledge before us, usefully. There are spectacular exceptions in the history of picture frames. The evidence of the variety of forms that the act of framing has taken over time lies either in the words that have been written (or now, otherwise recorded) about art and its contexts, or, as manifested by the physical frames made to express and facilitate the relationship of the person looking and the artwork seen. These forms have, over historical time, been the result of the application of wealth to connoisseurship by the few who had the means to marry design and craftsmanship consistently (often over generations) to serve their own relations, societal and personal, with the valued objects to be framed. The Corsini dynasty was one such example, represented recently to New Zealanders through this exhibition, thanks to Auckland Art Gallery. New Zealand public collections, while not without some riches in historical western art, have many gaps and lack much depth. Even in encyclopaedic collections overseas, original framings are surprisingly scarce despite the fact that frames have an equally ancient and complex lineage when compared to the paintings they contain. Modernism had a profound impact on frame history, perhaps most importantly in its breaking down of the perspectival strategies into which frame design had been co-opted from the Renaissance on, making the requirement for support from the shape of the frame ultimately redundant and leaving only a mechanical or structural utility left for it. The key problem for us is that the loosening of our ties to the traditions of European art have inevitably made our perceptions of that part of our history more difficult, and with it the richly imaginative adornments that frame its art. These histories are the key to comprehending where our activities as framers fit in the broader scheme in a museum/art gallery context, which as in our case is a lot about contextualising singular examples of art, the framing of which, both in word and artefact, requires broad but relevant historical knowledge. The frames we saw were worthy examples for James’ and my ongoing discussions about the styles, fashions, the movers and shakers, their motivations, material technologies, the relationships between paintings and architectural contexts in play in the heyday of the most famous centre for art production and consumption in the western world. Electric light has not been well suited to the gilding of frames, nor has the large plate glass window, nor our famously bright sun. Despite my apparent aspersions, I was born, you could say, under the bright light of Modernism and I am indebted to such lessons from it as I listened to. I believe that, overall, the evolution of our own art forms has been helped by the course of 20th century style and content internationally. While there is no going back for our culture, and nostalgia alone isn’t enough, the accumulated evidence of where we have come from remains of enduring importance, I believe. Frames and framing have a practical value in this task. Ask your nearest historian. The municipal galleries in Auckland and Dunedin hold the strongest collections of European historical art with a proportionately smaller number of historic frames, with fewer of either but still valuable examples to be found in Christchurch, Whanganui, and the national collection at Te Papa. The spectacular experiment of the Italian Baroque provides evidence of a particular interest in visceral manipulations. I contend that all frames work to influence us to take notice of their contents and to mediate interior/exterior relations. Most often though, it is by the means of quieter strategies than those practised (and spread) by the Medici court from the mid-16th to the mid-18th centuries. What the framings of the period lack in self-effacement, to our eyes, they were often rescued I think, by the extraordinary subtlety of design and artisanal skills that redeem them, and that could only be challenged by those of the courts of Louis XIV to Louis XVI in France in roughly the same period, and for a hundred years from the early 17th century in the Dutch republic. It was the spread of influence from these centres that have had the most particular influence on frame design in the Anglo-centred world down through time to us and which echo in our homes and museums today―in however banal a manner that may be owing to the course of 20th century art and politics. A small group of us here in the US, England, Denmark and Germany are very involved in the ripple or wavy moldings and frames made by them , once the glory of Holland 16th century frames. If you want to be involved…write. I think that working your way into the craft side of framing by working in a framing business would help in acquiring some understanding of how to make frames, but also how to think about them in the ways I spelled out or hinted at in the article. James worked for quite a few years in the commercial framing industry and that experience has prepared him in many ways for his next move. 1 Many framing shops do not do much more than buy in mouldings so that what you come into contact with is limited by the preferences of the current market. They stock what they can readily sell. This is a very small view of the whole subject. However, some shops also make mouldings and this is the option you should look for. Surfacing is also a fundamental aspect in which I think you should aim to build skill, such as in gilding and if possible in casting, and best of all in carving though this is now very rare. 2 You can learn something about frame styles from this process but it is limited by what you see. I suggest you think about an art history degree if you don’t already have one to develop (or further develop) your personal relation to the artefact that is the subject of the frame. I think also that study in the field of decorative art is also important, or, in the field of architectural theory to provide a structure for your thinking. In many senses “history” is the operative word, and frames are all about contextual relationships and as such they operate in the interstice between fields. I think therefore that more than one academic field has to be in view. Exciting thought that one! Another possible entrée into the area is through conservation and it is possible to study towards this at a post graduate level. Combining craft and conservation skillsets would be a fantastic way to go if you develop or have a passion for the physicality of frames. There are now quite a few excellent books describing the arc of frame history, especially of styles and materials, but also speaking to the frame’s place within the wider history of the visual arts from architecture to painting. I still believe that putting your hand to making what you think will work on the particular piece of art is a great teacher. Best wishes for the delivery of your aspirations! How would an aspiring framer get into this line of work? I’m very interested in the art of framing but there doesn’t seem to be a clear path of study towards fine art framing. Should I simply start at my local framing shop?